Spontaneous adverse drug reactions (ADRs) reporting is a useful source of drug safety information in infants as only adult patients are routinely tested in clinical trials. This study was aimed to evaluate the spontaneously reported ADRs using WHO Adverse Reaction Terminology and to identify the common drugs associated with ADRs in children under 2 years of age. 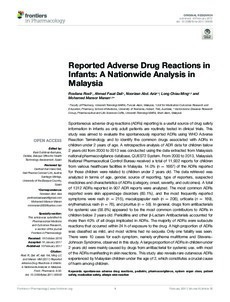 A retrospective analysis of ADR data for children below 2 years old from 2000 to 2013 was conducted using the data extracted from Malaysia's national pharmacovigilance database, QUEST2 System. From 2000 to 2013, Malaysia's National Pharmaceutical Control Bureau received a total of 11,932 reports for children from various healthcare facilities in Malaysia. 14.0% (n = 1667) of the ADRs reported for those children were related to children under 2 years old. The data retrieved was analyzed in terms of age, gender, source of reporting, type of reporters, suspected medicines and characteristics of ADRs (category, onset, severity, and outcomes). A total of 1312 ADRs reported in 907 ADR reports were analyzed. The most common ADRs reported were skin appendage disorders (60.1%), and the most frequently reported symptoms were rash (n = 215), maculopapular rash (n = 206), urticaria (n = 169), erythematous rash (n = 76), and pruritus (n = 58). In general, drugs from antibacterials for systemic use (58.8%) appeared to be the most common contributors to ADRs in children below 2 years old. Penicillins and other β-Lactam Antibacterials accounted for more than 40% of all drugs implicated in ADRs. The majority of ADRs were subacute reactions that occurred within 24 h of exposure to the drug. A high proportion of ADRs was classified as mild, and most victims had no sequela. Only one fatality was seen. There were 10 cases for each symptom, namely erythema multiforme and Stevens-Johnson Syndrome, observed in this study. A large proportion of ADRs in children under 2 years old were mainly caused by drugs from antibacterial for systemic use, with most of the ADRs manifesting in skin reactions. This study also reveals rare cutaneous ADRs experienced by Malaysian children under the age of 2, which constitutes a crucial cause of harm among children.